Spring Is Here… Time To Spruce Things Up A Little! Spring has sprung! Not sure about anyone else, but here at Stile Homes, we’ve been trying to spruce things up by getting some spring cleaning done. Did you ever notice how spring cleaning puts a smile on your face? I think it’s because we know that summer is right around the corner. Here are a few helpful tips on spring cleaning. After the long winter of being cooped up, light fixtures and carpets/rugs can be full of dirt and dust. Take time to clean your light fixtures, the ones that are easily accessible and the ceiling fixtures. Take your area rugs outside for a good shake down and maybe a few hours of airing out. We all know that the wall-to-wall carpeting could probably use a good cleaning too. Break out that steam cleaner! It may also help with those seasonal allergies. While you’re in the cleaning mode why not wash down your walls? Yes, the walls! Dirt also sticks to vertical surfaces. The easiest way may be with a good soft sponge and warm, mild, soapy water. If you’re afraid of using soap and water on your flat painted walls, try using a dry microfiber cloth. It will work just as well at removing dust. What about your furniture? During the winter months, your furniture has collected dust, dirt, body oils, and germs. And if you have a pet, it has also collected pet hair and dander. So haul out the vacuum cleaner and vacuum your upholstery. You can steam clean it as well. Make sure you test your furniture first in an unobtrusive spot to make sure that the detergent from the steam cleaner doesn’t fade the color or ruin your upholstery. Last but not least, attack that refrigerator! How many times a year do you actually give your fridge a good scrub down? No better reason than spring cleaning to give it a go. Dig way back and throw out that leftover New Year’s Eve cheesecake that you decided not to ever eat again because your resolution said so. After removing the old and new leftovers, check out your condiments. Bet you have a few that have expired. And what about that bottle of marinade from last year’s backyard BBQ? Yeah, that might need to find its way to the trash can as well. Now that your fridge looks like it has been raided by a horde of teenage boys, get down to the “nitty gritty”. Try using a magic eraser or a sponge and hot soapy water to get the stuck-on grime. Don’t forget to clean the outside too. Also, don’t forget a fresh box of baking soda to help absorb any odors that may be lingering. 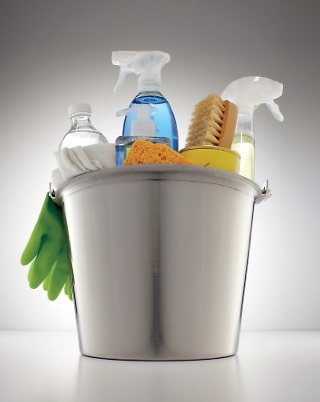 We hope that these helpful hints will get you started on your spring cleaning adventure. For more information about our new homes, visit our website! Drop us a line with feedback or questions. Don’t forget to check out our Facebook page, too!